These past few months have been brilliant for finding new brands to go gaga about! From clothing to accessories I've found two brilliant designers that I'm absolutely head over heels for right now. So who has got me so excited and I have to admit super excited to get dressed for this summer? 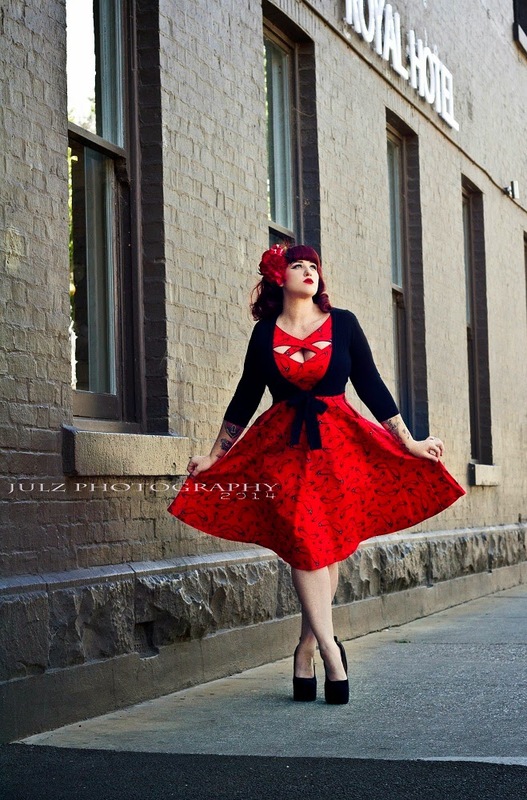 Voodoo Vixen and Gigi's Retro Closet! Yes I know I'm a little slow to the Voodoo Vixen party but I only discovered the brand midway through last year and fell hard for their latest range. Based in the UK and distributed throughout the world Voodoo Vixen are a pinup/retro inspired clothing company offering both standard and plus sizing. With stunning unique prints, great fabrics and amazing fits you will definitely love many if not all of their range. I recently had the pleasure of shooting my two favourite dresses from their current range. From the moment I laid eyes on this amazing cats eye glasses print I was sold! In my mind there is nothing better than a bold red swing dress but when that dress comes with a brilliant black retro glasses print and a cross over neckline then it's even more of a dream. A full skirted swing style with a unique criss cross neckline and thin black piping around the bustline. I paired this with my amazing red floral hair flower from Gigi's Retro Closet. Gigi's is an Australian based handmade hair accessories company and I swear I'll never need another hair accessory shop again. Her work is absolutely amazing and the detail on each clip or fascinator is fabulous. At the Gigi's Retro Closet Etsy shop you will find a hair accessory for any and every occasion. From Christmas, to Halloween, every day and one for every outfit. With a large floral clip priced at $25 and full facinators at $50 plus you can pick up a few stunning hand made items to cover all of your outfits. I adore the pairing of the reds in this clip and the different texture and size of each of the petals. 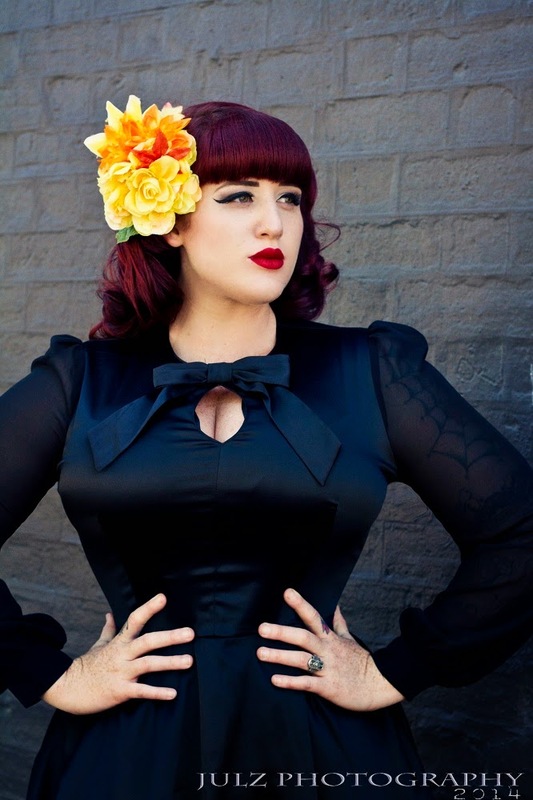 I'm wearing the Connie Dress in a size XL and I found it to be a perfect on the waist, around the bust and sleeves. The best feature other than the glasses motif has to be the hidden pockets, they always make an already fantastic item into an amazing one. Next is my new absolute favourite and the best LBD I've ever owned - the Hazel! This little mod inspired number is an absolute dream to wear with its silky soft stretch fabric and sheer sleeve. Shorter than the previously shown style but still a real showstopper. Now the Connie Dress is more my day time style while this is definitely a date night or cocktail party style. I'm wearing this style in a size XL and I've found it to be a perfect fit with my curves. Now this style is sold out on Voodoo Vixens website but you can find it via the following online retailers : Eggs n Chips (UK), Beserk (AU) and Rebels Market (UK). I paired this with my bright and beautiful tropical yellow hair flower and I adore the mix of black with a bright pop of colour. This amazing piece is perfect for my deep red locks and I love the how it works with my outfit. Each hair clip or accessory is fastened with sturdy alligator clips and can be secured with extra pins if you plan to dance, jump or frolic. As you can see this dress is rather short but it's the perfect length for my height and my booty. Any one out there with an ample rear knows how shorter skirts can become super mini due to a big booty. This is the perfect length and does not show anything. To top the look off I wore my absolute favourite platforms from Shoe Me Gorgeous. I can't get enough of these polka dot beauties and need another pair asap. Many thanks to the always amazing and super fun to work with Julz Photography. I absolutely adore working with Julz and it's so nice to get out of the studio and take some full length images. Can't wait to work with her again in the new year! On a more festive note I just wanted to wish you all a Merry Christmas and to thank you for following me for the last few years. It's been an absolute pleasure creating new photo shoots and styling amazing pinup clothing for each and every review. I can't wait to see what 2015 has in store for Curves to Kill!